When it comes to the ‘clinch’, the fire is still burning brightly in Peter Senior’s belly, that’s for sure. The veteran Queenslander did it again at the weekend with success in the Victorian Senior Open at Yarrawonga Mulwala Golf Club Resort. And the ‘old’ boy did it in style too as the field comprised some of Australia’s ‘senior’ stars, including the likes of Peter O’Malley, the preceding Ladbrokes Legends Tour event winner Mike Harwood and former Australian Open champion Peter Fowler, who battled it out over 36 holes on the Lakes and Murray Golf Courses. 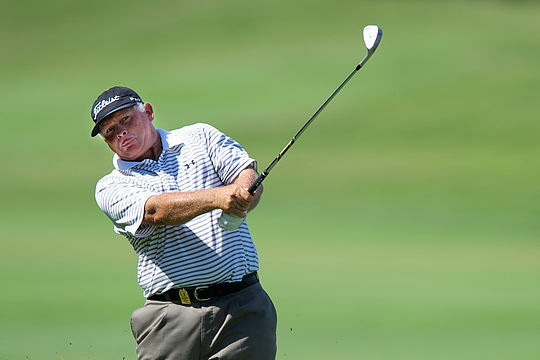 The first day saw 78 professionals and 10 elite amateurs compete in a pro-am format, where O’Malley and Senior mastered the breezy conditions to end the opening day tied for the lead on five-under-par 67. Terry Price and Paul Powell sat two shots back on 3-under 69. Day two saw improved playing conditions with a seeded draw of players tackling the Murray Course. It was Fowler who made the most of conditions, charging early to card a seven-under-par 65 to take the clubhouse lead. Yet Senior’s top form continued with a birdie two on the 17th and a two-putt par on the 18th to score a two-shot win over O’Malley.